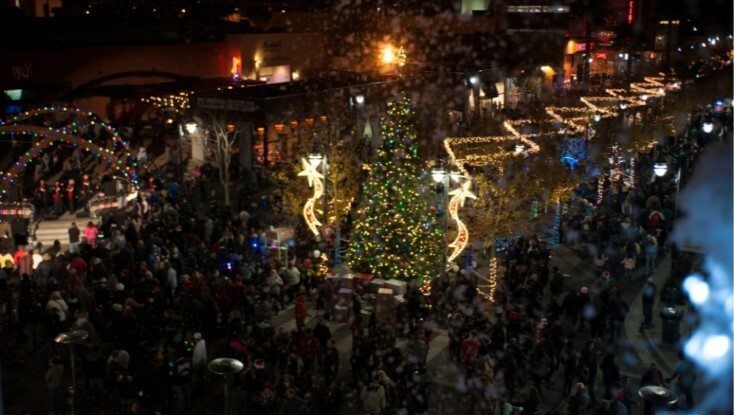 LANCASTER – Seasonal entertainment, stunning holiday decorations and Christmastime activities are coming to downtown Lancaster this Saturday. A Magical BLVD Christmas will take place from 5 to 9 p.m. Saturday, Dec. 8, on Lancaster Boulevard, between between Beech and Genoa Avenues. This event is free and open to all ages. Attendees can take a captivating journey on the holiday train through brightly-decorated streets; make one-of-a-kind crafts at Santa’s Workshop; decorate cookies; and visit the petting zoo. The event will also feature a live ice sculpting demonstration and real snow in a children’s sledding area. This year’s entertainment will include the World Champion Sunday Night Singers performing a number of holiday favorites, a song and dance performance by Fashionate Rhythm and Dance Company, and a ten-foot-tall singing Marionetta. Highland High School Choir, the Palmdale Chamber Singers, the Quartz Hill High School A Cappella Choir, and the Quartz Hill Chamber Singers also will perform during the evening on three stages — the Bandstand stage at Ehrlich Avenue, the Cedar stage, and the outdoor stage in front of the Lancaster Performing Arts Center. Special guests and singing quartet Just Us will perform their unique blend of holiday classics throughout the evening. The ever-growing Christkindlmarkt, featuring local crafts, homemade goods, and specialty seasonal item, will offer attendees countless Christmas gift options. And more than a dozen food vendors will be cooking up delightful holiday treats. “Join in the festive holiday celebration with family, friends, and neighbors — and experience a true winter wonderland at A Magical BLVD Christmas,” states a news release by the city of Lancaster. For more information, visit www.cityoflancasterca.org/magical. 5 comments for "‘A Magical BLVD Christmas’ happening this Saturday"
Will the homeless be dressed as Santa’s elves?